and really do appreciate you giving up your valuable time to help us. 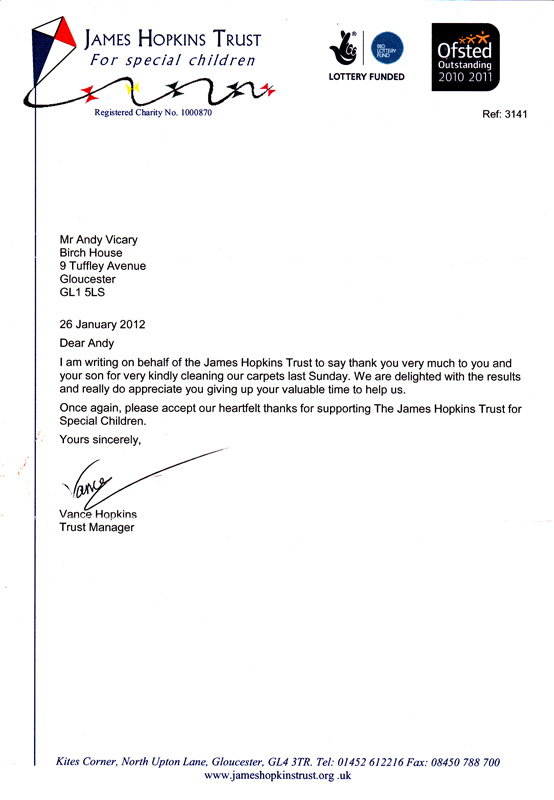 Once again, please accept our heartfelt thanks for supporting The James Hopkins Trust for Special Children. Just had carpets in the whole house cleaned they have come up beautiful (after a few little accidents from our dog) confident that we will get our deposit back now. Andy was friendly and professional. 100% recommendation. Thought I was gonna have to buy a new carpets.. Saved myself a fortune getting my carpets cleaned and they look as good as new! Highly recommend! Amazing service! Highly recommend! I needed an emergency carpet clean and within half hour of phoning, arrived and completed a fantastic job!! Very satisfied. Thank you again! Had sofa and living room carpet cleaned. Great service, good price and excellent results. Excellent Job, thank you. 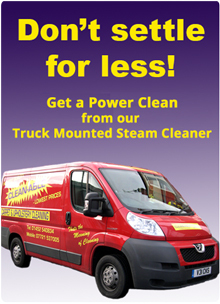 Great clean at a very competitive price. Competent removal of muddy radiator water spill too. Thank you very pleased with the work you did for me 2day carpet looks amazing great job..
My carpet now looks a million times better! Even stains I didn’t think could come out did 🙂 would highly recommend, thank you! Five star once again Andy helped us out at short notice can’t thank you enough! Top class service, polite friendly and reliable! Will definitely use again ! Outstanding deep clean carried out by professional operatives. Well recommended. Very pleased with my result. Will be hiring again. Andy has cleaned my carpets sinced 1994 has never let me down always done a terrific job at a great price. 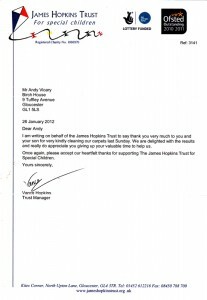 Andy has looked after my carpets and upholstery for many years and always does a wonderful job i would never hesitate to recommend him. Clean-able have cleaned our office carpets and always brought them up very well indeed. I booked Clean able after seeing their leaflet and felt confident from the start because their address was on the leaflet i was looked after in a professional manor from the start of the job until completion. Excellent! Fantastic job! Thanks for squeezing in a quick clean so early in the morning! Kids ketchup stains removed from the carpet and no need to buy a new rug now it looks like new again. Thanks! Sadly I have now moved away from the area. Andy Vicary at Clean Able is the very best carpet cleaner I have ever had. I just wish that he was working in Hampshire!! !